So this is Part 2 to this cupcakes craze o mine. 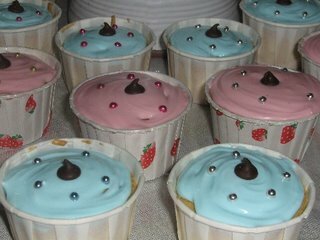 Last Thursday, I managed to make about 30 cupcakes for my daughter’s 4th birthday - Choc Chip Cupcakes with Royal Icing. I used the same premix as before but added semi sweet choc chips and made royal icing with orange flavouring. I am still an amateur so I had to be contented with the outcome. I am proud to say I tried my level best to make some homemade stuff for my lil angel. 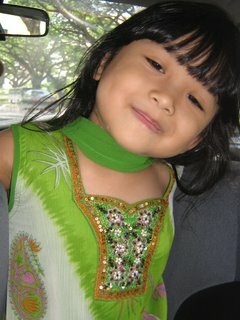 Tihani, the bday gal, in her Punjabi suit, on the way to kindy for Racial Harmony Day as well as cake cutting. 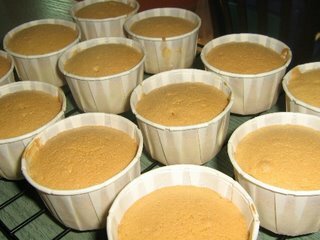 Beat egg whites and gradually add confectioners sugar till stiff. Divide the mixture into two bowls. Tint one with pink and the other with blue coloring. Pipe onto the cupcakes and decorate with extra choc chips and sugar pearls. Wah no need to order liao...can make yrself already. Next time can order lah ;o). Hey one day we should meet and bake together lah must be fun!!! Yorshire Pudding - Gracias sis! Sowee .. & 5 Takes!